In today’s economy, it is very much important to find a new car loan that will perfectly match your budget. We offer competitive new car loan rates that will help you save more money. For more than 18 years, Speed Credit has been the new car buyers’ smart choice in obtaining a cheap new car loan with flexible terms. Speed Credit will simplify and quicken your new car financing process so that you don’t have to waste a lot of time on any paperwork. Be it a luxury car, MPV or a sedan, we are confident that we can get you the best new car loan plan through one of our 13 bank partners in Singapore! With our low new car loan interest rates, cruising in the new car of your dreams will be sooner than you thought. Very fast loan processing and approval. 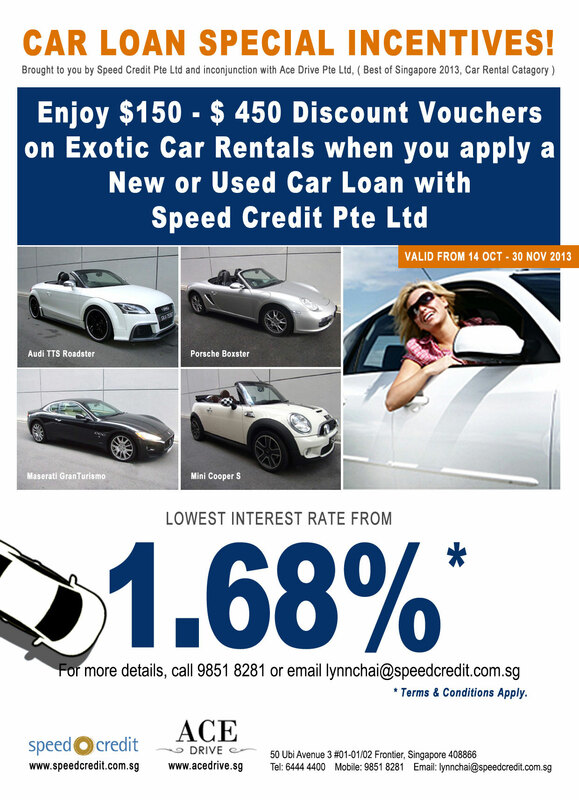 Very low new car loan interest rates from our 13 bank partners. Flexible new car loan terms. Easy and convenient repayment with fixed monthly installment. Free insurance quotation. As Speed Credit is partnered with 15 of the most reputable car insurance companies in Singapore, we can easily send you 5 of the cheapest car insurance that is suitable to your needs. Once all documents are completed, we will submit your new car loan application to your chosen banks or to our bank partners. We will notify you within 1 working day regarding the status of your application. Once your new car loan application is approved, our car finance specialist will contact you for further instructions. For as low as 1.88% p.a. Please click here to see our non-promotional new car loan interest rates. Thank you. For more information about our new car loan service, you can contact our friendly car finance specialist, Lynn Chai at +65 9851 8281.